Healthy and yummy Oatmeal, chocolate banana cookies. They turned out kind of bread like, not super chewy, but this may vary on how long you leave in stove and type of flour. Preheat oven to 375 degrees F. Spray cookie sheet with nonstick spray, or line with parchment paper. In medium bowl, whisk flour, baking powder, baking soda, salt and allspice/pumpkin spice. In a separate large bowl, whisk together melted butter, applesauce, sugars, egg and vanilla blend well. Mix in mashed banana. Add flour mixture to liquid applesauce mixture. Mix very well then fold in oats. At this point, you can decide if you’d like to mix in the chocolate chips or save them to sprinkle on op of each scoop of cookie dough. I made half with sprinkle on top then mixed in remainder of chips into second batch. Drop rounded Tablespoonfuls onto parchment on cookie sheet 2 inches apart, the batter should make about 18- 22 cookies. Bake 10-12 minutes, or until set, your stove may only need 8 minutes. Remove from oven to wire rack to cool completely. 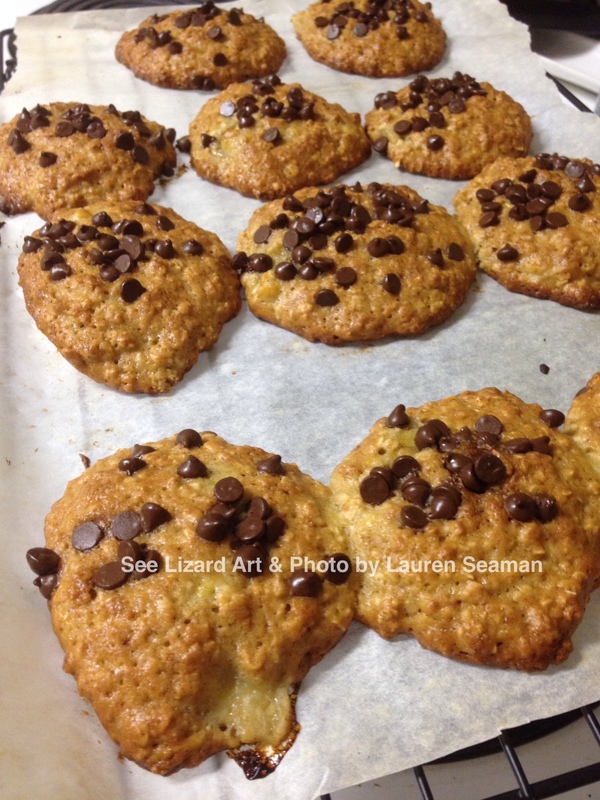 Posted in Cooking and tagged apple sauce, banana, chocolate chip, chocolate chip cookie, cookie, healthy cookie, oatmeal, oatmeal cookie, recipe, yummy on February 27, 2014 by See Lizard Art & Photography.